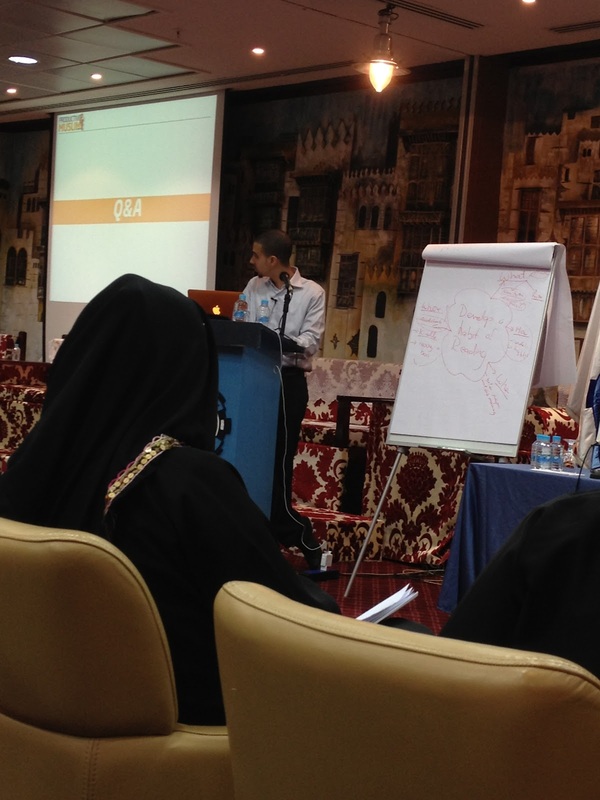 Productive Muslim held their 4th seminar on Wednesday in wait for it…Jeddah! I was lucky enough to get a ticket, they sold out pretty fast. YIG volunteers did a fantastic job organising the event in collaboration with JCCI who generously provided the venue. It started at 5pm and finished a bit before 11, with Salah and refreshment breaks in between. I wanted to write a review of the seminar but I’m feeling rather overwhelmed by the task. I can say one thing it was definitely a very productive seminar seeing that so much was covered in a short time. I will update this article with the links to the slides handout, once it becomes available. For now I will include highlights what made the most impact on moi, hopefully Abu Productive will forgive me if I don’t do justice to the material covered. I’ve been reading many of the articles on the Productive Muslim website, so I was familiar with some of the topics covered by Abu Productive, but mashaÁllah, his energy, and enthusiasm is infectious and he is very easy to relate to. The point that really motivated me was that he was a young brother who understands all the social media entanglements and Genration X/Y issues such as our addiction to mobile phones, and the same time he was teaching us how we could pray Tahajjud/Qiyam right after Isha, how you should be reading at least 30 minutes of the Quran daily and not slacking off and reading only a page or much, much, less…somewhere in the back of my mind I hate to admit I didn’t think anyone our age could do any of that. The resources that Productive Muslim provides such as the Daily Taskinator, the Habitator and the ultimate Goal Planner are all very practical tools to help you implement what you learn at the seminar, and printouts were distributed to all attendees. 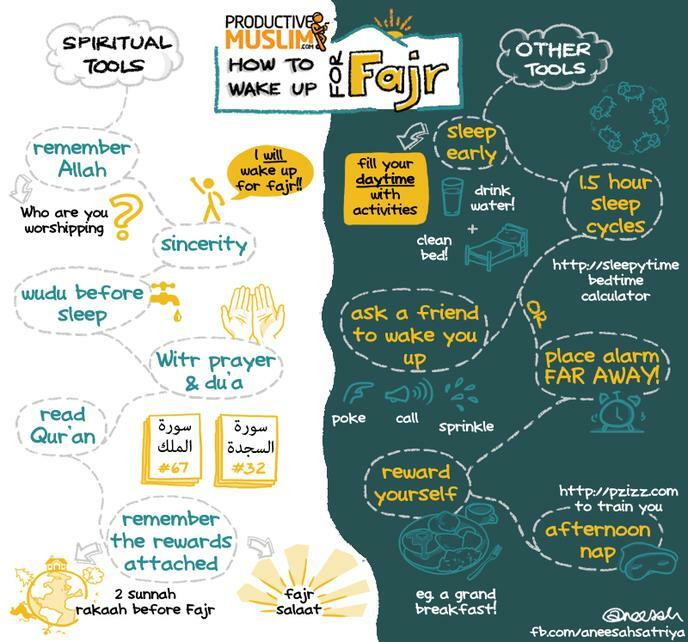 One of the main topics that was covered was sleep management, how to wake up for Fajr, and how to stay awake after Fajr. Now, although alhamdolilah I don’t have trouble waking up fo Fajr, but as soon as I’m done with my prayers I immediately jump back into bed. I’ve also become a bit of a night owl, and I think its really affecting my energy levels and the amount I get done in any given day. So, I was delighted that this topic was covered in detail. “O Allah, make the early morning hours blessed for my nation/ummah”. Abu Productive also explained that all the productivity books he’d ever read about successful people from all over the world they all woke up early. Do you see a connection here? Now, I’m sitting there thinking I’ve been sleeping through the blessed hours ever since I left school :(…hmm not a very blessed or successful life, huh? Then he covered on how to stay up: have an early morning routine. The routine should be planned out before hand so that you don’t have to think of what to do next otherwise you will simply crawl back into bed as the sheer effort to think of what to do next will slip you up. SO SIMPLE! WHY DIDN’T I THINK OF THAT BEFORE? Unfortunately, because of the weekend haven’t really been able to go to bed early, but post-Fajr I’ve been able to stay up till 630am, and then I tend to collapse into bed. I guess, I’m using baby steps, and in a few days inshallah will try to stay awake until ..gasp ..the afternoon siesta/nap time. I also want to experiment with the sleep cycles, find out if my sleep cycle is 90 mins or more, apparently most people have 90 minute sleep cycle but for some people it can be up to 120 minutes. That was one of the ‘Homework assignments’. You can use this tool called sleepyti.me to figure out what time you should sleep. The 18 sources of barakah was also touched upon, and we were asked to chose one source which we wasn’t part of our daily life and to tap into it for a week and try to build on it from their. I’m going to try incorporating istighfar, as there are loads of benefits :-). Ever since Facebook and Whatsapp became an (I hate to admit it) integral part of my life, I think my focus, on any task generally, and computer related specifically, has gone down the proverbial drain. Abu Productive advised us to have a ‘disconnect time’ from all technology, for e.g early morning till 7. I hate to admit after my Fajr alarm goes off, while I contemplate leaving my comfy bed, I scroll through Facebook on my phone-I’m not sure what earth shattering revelation I’m expecting happened through the night, but yeah I do it. So, I’ve also been enforcing this and it does help concentration in Fajr. Another cool tip was how to engage in distraction free writing, and I really need that for my blogging, he suggested WriteRoom for Mac users, and I Googled and found Q10 for Windows and it’s free. This post was drafted on it (look how long it ended up being) then I did spell check on Word. You get full screen black background type no frills writing program, which hides all tabs. A crazy tool is Freedom software which is an internet blocking software- it blocks access to the internet for your desired set amount of time- will not let you access the internet even if you restart the computer-dangerously effective! The 3 ways in which Islam helps to boost our focus: Salah, recitation of Quran, and lowering the gaze. Now, I’d heard about the first 2 in relation to focus but the third one was an eye-opener. I don’t have a problem with lowering my gaze, alhamdolilah, I don’t think most sisters have a problem..(but certain TV shows are making me feel guilty) :(, but I never realised the benefits before. Lowering the gaze helps your heart focus. ” The soul is a temptress and loves to look at beautiful forms and they is the guide of the heart. The heart commissions its guide to go and look to see what is there and when the eye informs it of a beautiful image it shudders out of love and desires for it. Frequently, such inter-relations tire and wear down the heart and the eye. Therefore, when the sight is prevented from looking and investigating the heart finds relief from having to go through the arduous task of (vainly) seeking and desiring.” Ibn Al-Qayyim. You may also like my post on Seeking Barakah: 18 sources. Next Post I’m an Expat and I Blog! Wow lot's of resources, JZK! Thank you for sharing what you've learnt. Jzkk, and thank you for sharing such simple yet effective tips and tricks with us Abu Productive.